Only buy the WIC items that you need. You do not have to get everything at once. At the check-out insert your eWIC card into the card reader. Enter your PIN number and press enter. The cashier will then ring up your groceries. The card reader will ask you to confirm the WIC foods before deducting the WIC purchases from the balance on the card. The cashier will give you the ending receipt that will have your remaining WIC food benefits balance. You can get a new food list with your remaining balance for the month at your local WIC office. Any food benefits for the current month still on the card will expire at midnight the last day of the month. Only the Authorized Representative at the WIC office can change the PIN for an eWIC card. DO NOT try to guess your PIN. If the correct PIN is not entered on the seventh try, your PIN will be locked. This is done as a protection from someone guessing your PIN and getting your food benefits. If your eWIC card is lost, stolen or damaged or you have questions regarding WIC foods or amounts contact your local WIC office by tapping the “Find a WIC Office” button. 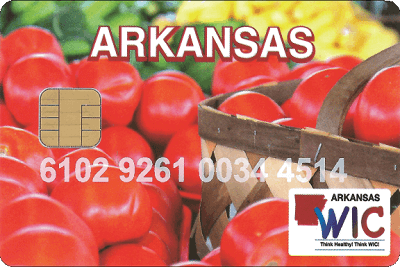 You can also call the State WIC Office at 501-661-2508 or 1-800-462-0599 or wic.program@arkansas.gov.